The foreign beer that wasn’t really foreign. At some point, Miller Brewing Company thought it would be cute or whatever to brew a replica German beer in America and sell it for two or three bucks more than the going rate for its domestics. Even though it was a domestic. They wrapped it in a handsome sky blue label and even put silver foil around the neck like you would a bottle of fine champagne. And yet it never really caught on. It just didn’t have the “it” factor of a real foreign beer, because let’s face it, Milwaukee is hardly Amsterdam or Munich. 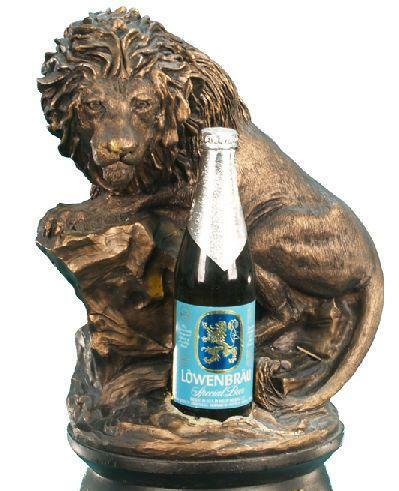 Lowenbrau was a pretender stepping into the ring with giants like Heineken and Molson Golden, and it got pummeled. Even smaller players had its number. Canada’s Moosehead had cool “Moose is Loose” T-Shirts and Germany’s St. Pauli Girl had buxom Bavarian (no matter the beer was actually brewed in the Hanseatic city of Bremen) barmaids that looked great on huge posters. Lowenbrau had a lame version of Wham’s “Last Christmas” video. I remember leaving a six pack in the refrigerator at a high school party once, (which would pretty much guarantee you getting a couple of bottles nicked) and no one stole even one of them. So if it couldn’t even tempt a bunch of punk kids walking around with swill like Little Kings Cream Ale and Mickey’s Big Mouths in their hands, which chance did it have when the Michael Milkens and Ivan Boeskys of the world sat down for a cold brew?